Click here for audio of Episode 940. Today, we face time-warp on a railway train. The University of Houston's College of Engineering presents this series about the machines that make our civilization run, and the people whose ingenuity created them. A Scottish couple joined my wife and me in the dining car of the train from Toronto to Edmonton. He turned out to be the retired head of maintenance for the railways of Western Scotland. He was literally taking a busman's holiday. Earlier on the trip, I'd found Dionysius Lardner's book on steam engines and locomotives in a dusty shop. Published in 1836, it told the state of the art of railways only 16 years after Trevithick had run the very first locomotive in London. So I showed my old book to this Scottish engineer. He plunged into it. He turned a knowing eye on the browning pages and told me which elements of those embryonic engines were still to be found on modern railways. He paused lovingly over one 160-year-old engine that his staff had built in a modern replica. Then he drew a recent newspaper clipping from his wallet. It told about the system the Germans and Japanese are building. A train will run at 250 mph, magnetically levitated on a cushion of air. I read the article while he turned pages in Lardner's book. We could go a lot faster, but the roadbed isn't up to it. The curves are a little tight for passenger comfort at high speed. Besides, you don't want to subject those old wooden ties to much pounding. Nowadays they make railway ties of concrete. And I realized this ride was an old experience frozen in time. At first, railways had developed very fast. Lardner tells about a statesman who'd recently suffered an accident. Friends used one of those early locomotives to get him to the doctor fifteen miles away. By pouring on coal they'd managed an astounding 36 mph. A year later, the editor of my American copy adds a footnote. An American line now has trains that reach 40 mph, not much slower than we now moved through Canada 160 years later. So I rode the time-warp of a technology that'd once transformed the Americas and now was fading. I enjoyed two days of quiet, gently rocking recess from work. I read Lardner and talked with this man who'd spent 47 years in railways -- listened as he told of future trains that'll soon approach the speed of sound. America once ruled the rails. By 1900 we'd reached speeds of 100 mph. Then, after WW-I, cars and airplanes distracted us. We may yet reclaim the technology that was this engineer's entire life -- which once shaped life on earth and now offers to shape it anew. I hope we do. After two restful days among lakes, rocks and trees that're invisible from 30,000 feet, I hope we do. 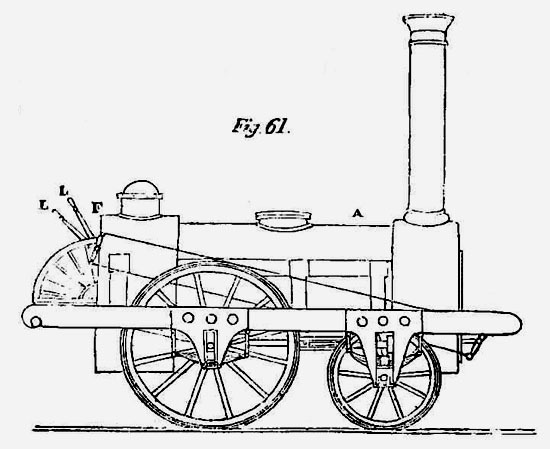 Lardner, D., the Steam Engine Familiarly Explained and Illustrated , Philadelphia: E.L. Carey & A. Hart, 1836. See especially Chapter X, Locomotive Engines on Railways, Chapter XI, Locomotive Engines on Turnpike Roads, and Chapter XIX, Plain Rules for Railway Speculators. I'd bought both Lardner editions mentioned above at Ahab's Books in Boston. The clipping that the man showed me was from a June 20, 1994 Canadian paper, I don't know which one. We were riding on Canada's VIA Passenger Train Network, Silver and Blue Class. This episode was written in 1994. Since then the magnetic levitation rail systems mentioned above have been greatly developed. See, e.g., Episode 1745.